1. Core the apples, cutting into quarters, leaving the skins on when slicing. 2. Preheat oven to 375 F degrees. Line a large cookie sheet with parchment paper and spray paper with cooking-oil spray (or brush lightly with vegetable oil). Lay 1 sheet filo on paper and brush lightly with a little melted butter. 3. Sprinkle 1/2 teaspoon of cinnamon or nutmeg. 4. Repeat layering 5 more times (with filo, butter, apples and spice), pressing firmly so it sticks to sheet below. 5. Lay the last filo sheet on top, brushing with remaining melted butter, and sprinkle top with spice. 6. Bake until filo is golden brown, approximately 25 minutes. Cool for 10 minutes, then serve. 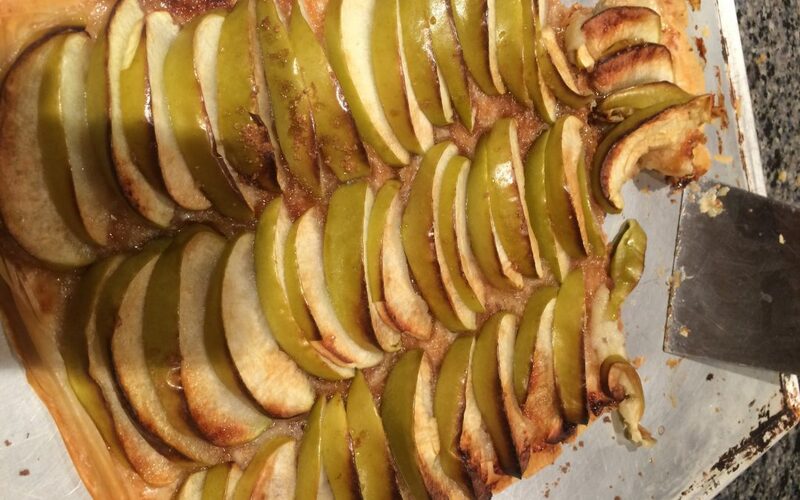 ***For a tart taste – use Granny Smith apples. For a sweeter taste, use Fuji apples.